The New York Yankees announced Saturday that they have placed RHP Masahiro Tanaka on the 10-day disabled list with mild strains of both his right and left hamstrings, and recalled infielder Ronald Torreyes from Triple-A Scranton/Wilkes-Barre. 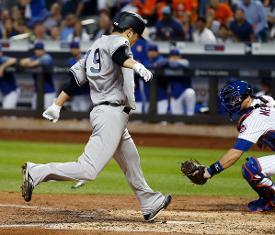 Tanaka pitched five innings of one-run ball for the Yankees in Friday's 4-1 win over the Mets, but he appeared to stumble coming down the line while scoring from third on Aaron Judge's sacrifice fly in the top of the sixth inning. Tanaka immediately went down the tunnel after entering the dugout, and was replaced on the mound by Jonathan Holder to start the bottom of the sixth. "Just both hamstrings tightened up on him; he felt it grab a little bit in both hammies (while scoring)," Yankees manager Aaron Boone said following Friday's game. "Not sure the severity of it really - we got an IV in him when he came out of the game - but it's one of those things where we'll evaluate tomorrow and see where he's at. Tanaka, who is 7-2 with a 4.58 ERA in 13 starts this year, told the media Saturday afternoon that he has "low-grade" strains of both hamstrings, and will start his rehab right away with a few days to a week of treatment. He did not have a timetable for a possible return, even saying he wouldn't guarantee a return prior to the All-Star break. Boone, however, was a little more optimistic. "I think it's weeks," the skipper said, "but mild enough with both hamstrings that I don't think it will be that long. He'll be shut down for a few days, but optimistic that it's not too serious, and I think it's very possible he's back before (the All-Star break)." Boone also said that the team is "working through options" to replace Tanaka but they "kind of have an idea," and whoever it is would probably be slotted in on Friday; if the Yankees were to stay on rotation, Tanaka's next turn would be Wednesday, but Monday's off day allows the Yankees the opportunity to temporarily skip the spot and not have to slot someone in until as late as next Saturday. General manager Brian Cashman later corroborated Boone's report, telling the media that the "options are internal," and he said that the Yankees "are leaning one way" but he wouldn't specify further. Torreyes started the season on the Yankees' roster, but was optioned to Triple-A when the Yankees activated Greg Bird from the DL on May 26. The utility man was hitting .339 with six RBI in 22 games before being optioned, and he has hit .194 in nine games with the RailRiders since the reassignment.